Movies in general are a great source of inspiration. When my life gets rough, motivational movies remind you to be stronger. There is something that you get to learn from every movie if you want to. 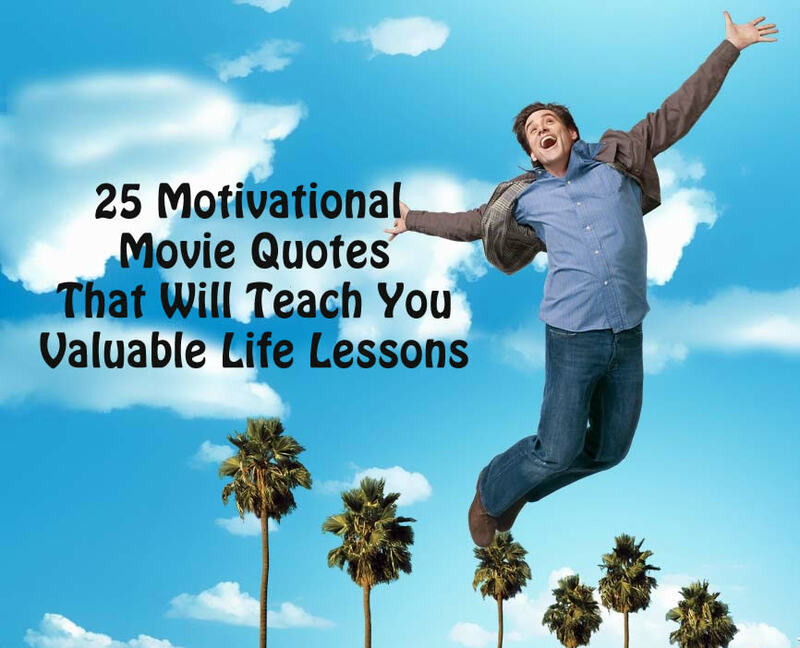 Here are 25 inspirational movie quotes which will teach you the most valuable life lessons. Be determined. Instead of intending to just try, do it. This is commonly used now, but it, I heard it first in the Star Wars. Learn to let go and be clear of where you really want to head for. Your past experiences are valuable lessons to you now, learn from them. Just be yourself because you’re unique and you’ll shine. Life’s too short to miss out anything, try to take it slowly. You should love and take care of yourself because after all, it’s your own life. Everyone has a choice. You can choose your own path in life. You deserve what you want when you’re trying your best to fight for it, no one can take that right from you. There’s no perfect time for anything, do it now or you’ll regret later. You don’t need to hide yourself because you’re afraid of what others think of you. You have the choice to live your own life. Just keep going, you’ll make it one day. The least expected things happen at your least expected time in life. Never give up on your dream, fight for it. Don’t get stuck in your own little world because the purpose of life is to explore and experience. Stop trying to please everyone because it’s impossible. Do what makes you comfortable. Believe in yourself. Your confidence will lead you to success and happiness. In order to achieve your dreams and goals, you’ll go through tough times for sure but hold on! Make every moment count, enjoy your life time and don’t waste it. The little things you do today could make a great difference in future. Don’t take missing any opportunities as a bad thing, you never know what life is trying to teach you. Achieving greatness is all about how much effort you make throughout the time. Instead of seeking for happiness, live the moment and that’s where happiness exists. If you wait for others to complete you, you’ll never be able to have peace in your mind whenever you’re alone. Always have hope. Be optimistic for your future. Before you do anything, be clear of why you want to do it. The purpose is an important reason to support what you’ll do. Are there any movie quotes that have greatly inspired you? Leave the quotes that inspire you in the comments section.